Britten was a prolific composer of songs: from his earliest compositions to his last years, song played a central role in his creative career. These CDs contain the complete original songs for solo voice and piano, including world premiere recordings of some of his earliest songs, together with some of his great cycles – the works spanning nearly 50 years of his life. 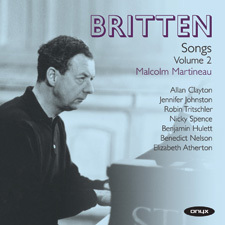 The recording follows Britten-Pears Young Artist performances of the Britten song cycles at the 2009 Aldeburgh Festival. Who are these Children? : Who are these Children? ‘Fish in the unruffled lakes’: What's in your mind? On this Island: Let the florid music praise!